When New Jersey native Leanne Nieforth ‘16 arrived at NC State four years ago as an animal science major, she aspired to attend the College of Veterinary Medicine and eventually become an equine surgeon. Eager to build research experience, as a freshman she began working in Dr. Jack Odle’s Laboratory of Developmental Nutrition alongside senior research associate Dr. Sheila Jacobi. 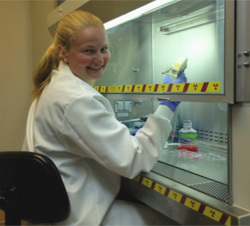 In the lab, where she continued to work through her junior year, Nieforth conducted both in vivo and in vitro studies to examine the effects of long chain polyunsaturated fatty acids on gastrointestinal diseases such as Crohn’s and necrotizing enterocolitis. 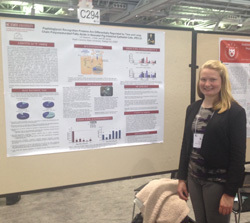 As a junior she won NC State’s undergraduate research symposium and, with support from a Park Enrichment Grant, went on to present the next steps of that project at the 2015 Experimental Biology conference in Boston. Around the same time Nieforth launched her research experience, she also began volunteering with a Cary, N.C.-based nonprofit called CORRAL Riding Academy. The organization promotes transformational life change for at-risk teenage girls by providing them holistic services, including equine-assisted psychotherapy, tutoring, mentoring, vocational training, and horseback riding lessons. Initially, Nieforth served as an exercise rider, working solely with the horses in an effort to acquire animal hours for veterinary school; however, she quickly found herself gravitating toward the mental health-related aspects of CORRAL’s programming. 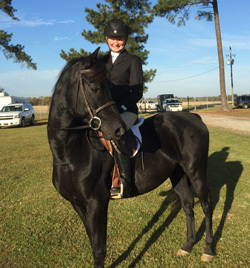 Nieforth now serves as CORRAL’s program assistant, which means she wears many hats: she teaches riding lessons, trains horses, writes grants, organizes fundraisers, and tutors the girls. Many of the young women who participate in CORRAL Riding Academy are victims of neglect or abuse, perform poorly in school, or are frequently absent from school. Nieforth was blown away by how, within a few months of their participation in CORRAL’s program, the girls were not just passing their classes, but showing genuine excitement for learning. Nieforth began drawing connections between the research she’d been conducting in the developmental nutrition lab and the results of equine-assisted therapy she witnessed on the farm. In the lab she learned about complex physiological mechanisms that directly influence an outcome, and how an external supplement – specific foods, for example – could have profound effects on internal processes. With this question in mind, Nieforth has taken the opportunity her senior year to undertake a new, interdisciplinary research project. Past studies suggest that when a horse and a human work together, their heart rate variabilities match, thereby regulating the human whose previous traumas may make it difficult for her to self-regulate. Nieforth is using these studies as the basis of her current examination of heart rate variability as a quantitative measure of equine-assisted psychotherapy’s efficacy. Simultaneously, she is working with her Park Faculty Mentor, Dr. Elizabeth Craig of NC State’s Department of Communication, to qualitatively define the healing processes occurring at CORRAL. Inspired by the dramatic transformations of the young women at CORRAL, Nieforth has allowed herself to put aside her earlier goals and change course. The once-aspiring veterinarian has applied to graduate school for clinical psychology and clinical mental health counseling. Nieforth feels fortunate for the mentorship she has received from both Jacobi and Craig, as well as from her other two Park Faculty Mentors, Dr. Lynne Baker-Ward in psychology and Dr. Shannon Pratt Phillips in animal science.